RARE FIND - Waterfront lots right in the heart of Pembroke/Laurentian Valley. 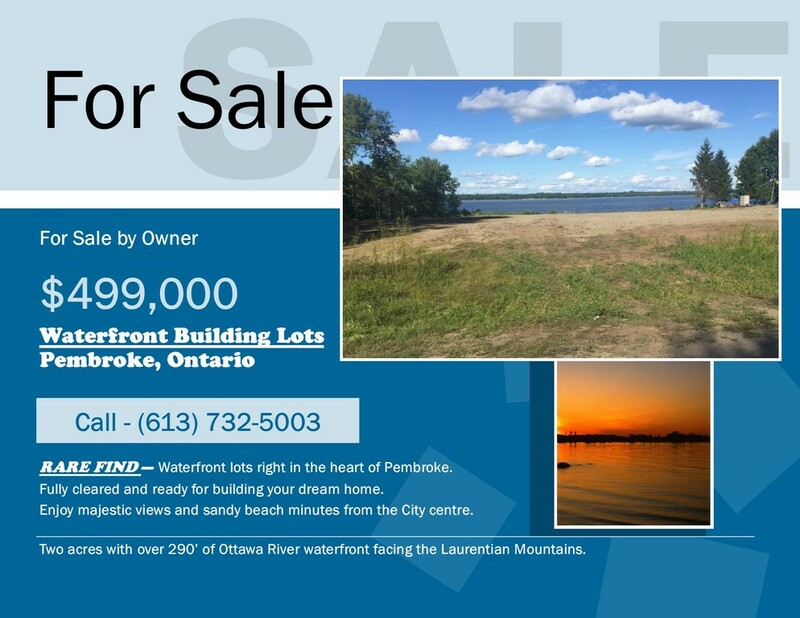 Fully cleared and ready to build your dream home overlooking the Ottawa River and Laurentian Mountains. Enjoy the majestic views and sandy beach minutes from the Pembroke's downtown and a short trip to the Ottawa capital area. These two adjacent lots are being sold as a complete parcel of land for the listing price shown. Seller will consider offers on an individual lot. This property for sale has been tagged by the seller as close to Arnprior, Deep River, Ottawa, Petawawa, Renfrew, Ontario. This seller is willing to negotiate commission with any real estate agent who brings an acceptable offer from a qualified buyer. Also offering a reduced rate for both lots purchased as a package. Will consider sale of lots individually. Thank you for viewing this For Sale by Owner property in Pembroke, Ontario.